With the Christmas season almost officially upon us (we held off on pushing yule tidings as long as we could! ), we thought it would be a good idea to revisit two classic holiday treats: the pizzelle and the krumkake. The two sweet delights are difficult to classify — are they cookies or cakes, or even waffles, or what? And as we said last week, if they’re tasty, does it really matter? Probably not, but we can try to answer the question anyway. Recipes at the end, of course! Pizzelles, whose name literally means “little pizza”, originated in the Abruzzi region of Italy, and are commonly referred to as cookies, although anyone who has ever made them can testify that the process is a little more difficult than simply mixing the dough and throwing it in the oven (as is the nature of cookies). Pizzelles, which are usually flavored with licorice-like anise, are a holiday tradition in many Italian families — both the baking and the eating! So basically, pizzelles are sweet holiday cookies with a name that means pizza. Makes sense, right? We could throw a further wrench into the definition by pointing out, for instance, that pizza is now a vegetable, but that’s a whole ‘nother cookie to crumble. And speaking of crumbs, if pizzelles are cookies, what do we make of krumkake? 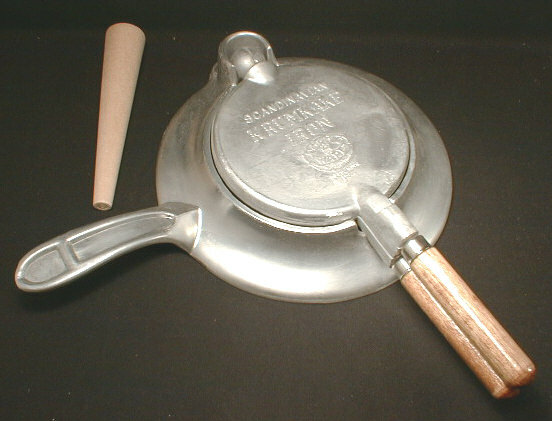 At first glance, the irons used to produce both pizzelles and krumkake are nearly identical. However, the devil is in the sweet, sweet details — or in this case, the batter, and also the depth of the grooves on the iron. Krumkake is a traditional Norwegian treat consisting of flour, butter, eggs, and sugar, with the addition of cream. Along with a larger egg ratio, the cream makes krumkake batter something closer to the thin batter used to make crepes, compared to the far denser pizzelle batter. Which brings us to the difference between the irons. 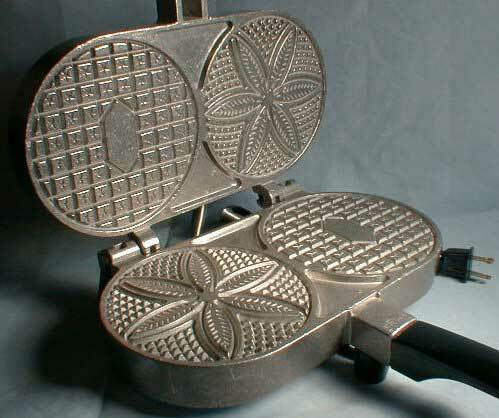 Because pizzelle batter is so much thicker, pizzelle irons have many deep grooves to bake the cookies all the way through — more surface contact means the heat is diffused faster, for all you food scientists out there! And the grooves not only produce the traditional waffle design, they also keep the pizzelle membrane thin for that crunchy texture. By contrast, the thinner nature of krumkake batter means the irons don’t need those deep grooves to bake the batter thoroughly. That thinness also allows you to roll the krumkake into a very delicate cone, which can then be filled with whipped cream, chocolate, and so on. Weigh eggs, with shell on. (One egg makes nine Krumkaker.) Each of the other ingredients should individually weigh the same as the total weight of the eggs. Remove cake with a fork and immediately roll up into a cone or cylinder shape over handle of either a wooden spoon, a shaping cone, or a cannoli form. Alternately, shape into a cup in a small bowl, and serve the cups as a dessert filled with whipped cream and fruit of your choice. The cone rolling part can seem intimidating, but it’s a lot easier than it appears. For some great tips, check out this tutorial from Chef’s Choice. Beat eggs and sugar until they become light and foamy. Add the melted shortening, a little at a time. Add the anise seeds, vanilla, grated rinds and juices. Gradually add the flour until a light dough is formed — light enough to drop onto the iron with a spoon. You may have a little bit of flour left over. Not everyone can deal with the anise seed getting between their teeth. If this is you, we recommend pulverizing the seeds in your food processor, electric mincer or mortar and pestle. You can also use the oil or extract for the traditional licorice flavoring of this cookie. Now try something different from tradition, by rolling the freshly baked pizzelle into a cone. Fill it up, and enjoy! Does a goro iron produce a cookie that is thicker like a pizzelle or a krumkakke? Or is it more similar to a Belgian wafer cookie in thickness?